At the end of the Democratic presidential debate, former Maryland governor Martin O'Malley noted that among the Democratic presidential candidates, "you didn't hear anyone make racist comments about new American immigrants, you didn't hear anyone speak ill of another American because of their religious belief." Others also expressed relief to see a debate without "the Republican circus of haters." With Donald Trump, the presidential candidate who declared that Mexican immigrants are drug dealers and rapists, leading in the polls among Republicans, and Dr. Ben Carson, who at one point said that a Muslim is not fit to be president, in the number two position, it is hard to contest the view that the Republican Party is the party most supported by the haters. But Republicans have contested this view. Donald Trump insists, "I love the Mexican people," and "I love the Muslims." Dr. Ben Carson asserts, "Republicans have done a far superior job of getting over racism." He argues that the Democratic Party is the party that favors racism because Democrats judge people by the color of their skin while Republicans judge people by their character. He also believes that white liberals are "the most racist people there are." Last year, when the former Democratic Senator Mary Landrieu insinuated that racial prejudice was behind some of the hatred of President Barack Obama, Republican leaders called on her to apologize. It is possible to use social-scientific measures to determine which party has the greatest share of members expressing prejudice toward racial, ethnic, and religious minorities. In my book, America Is Not Post-Racial: Xenophobia, Islamophobia, Racism, and the 44th President, using the 2012 American National Election Study, I conducted a similar analysis by political ideology, but not by political party. Here I present the findings by political party. My analysis supports the view of the Republican Party as being a less tolerant party. 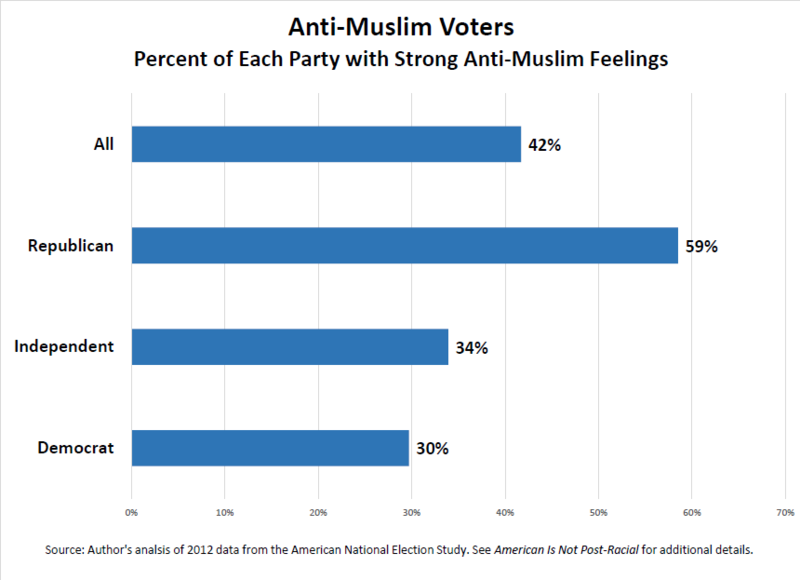 Members of the Republican Party express more negative feelings and more animosity toward America's minority groups. 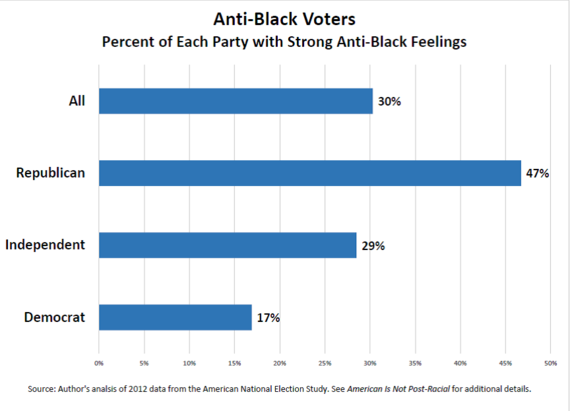 Nearly half (47 percent) of Republicans express a high level of hostility toward blacks, but only 17 percent of Democrats. 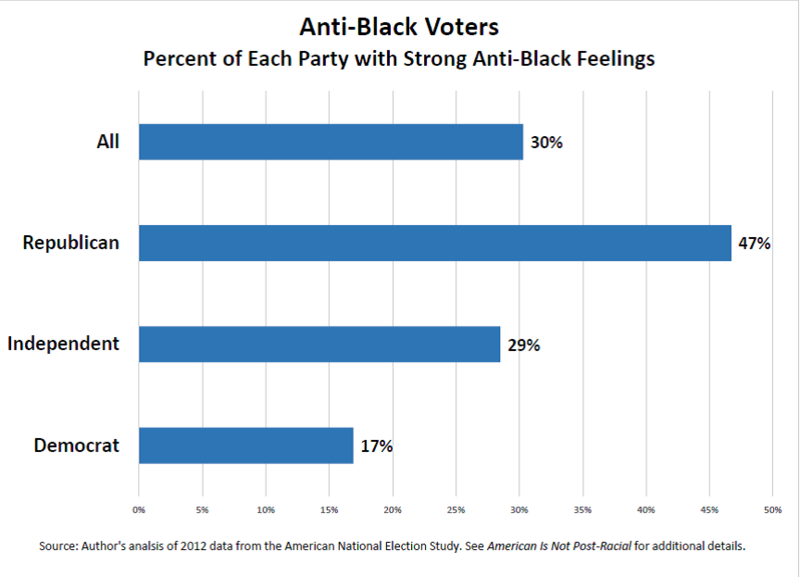 Independents fall in between with 29 percent expressing strong anti-black sentiments. Nearly two thirds (65 percent) of Republicans have strong negative feelings toward "illegal immigrants," while a little more than one third (38 percent) of Democrats feel the same. But it is not clear exactly what these results are measuring. Attitudes toward "illegal immigrants" could be shaped by attitudes toward immigration generally, attitudes toward unauthorized immigration specifically, attitudes toward the word "illegal," and attitudes toward the race and ethnicity of specific immigrants. Much of the concern with immigration in the United States is about immigrants from Latin America. And, I think, the real worry is that hostility toward immigrants might really be about a dislike of Hispanics and not about immigration policy per se. 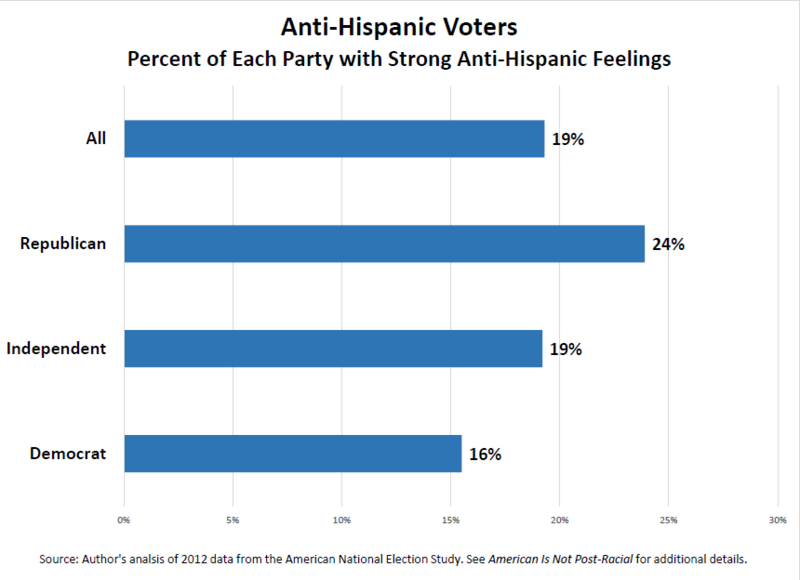 Looking specifically at feelings toward Hispanics, once again, Republicans have the most negative feelings, but the level of dislike is much lower than for "illegal immigrants." 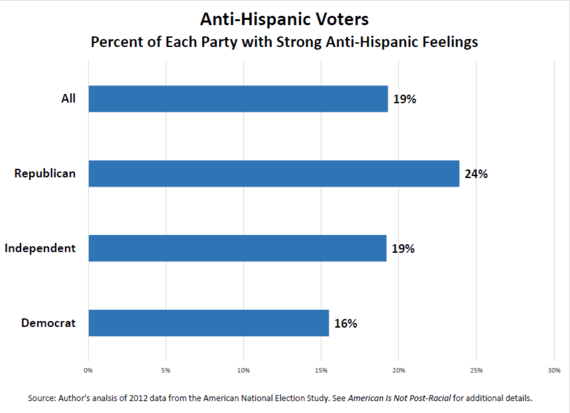 Only about a quarter (24 percent) of Republicans have a strong dislike of Hispanics. However, it is still eight percentage points higher than the rate (16 percent) for Democrats. 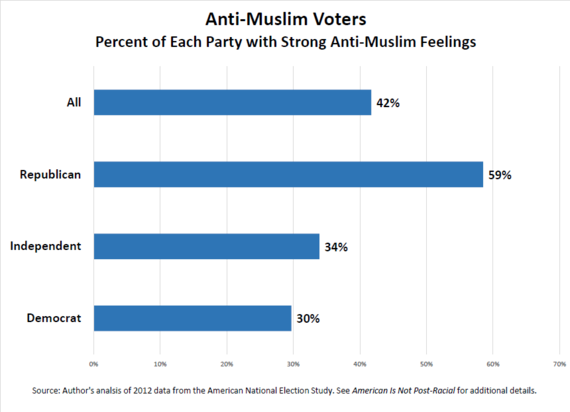 A majority (59 percent) of Republicans have strong anti-Muslim feelings, nearly twice the rate for Democrats (30 percent). Independents are at a similar rate (34 percent) to Democrats. I and others have pointed out that when one understands the attitudes of the members of the Republican Party, the success of candidates making anti-immigrant and anti-Muslim remarks are not too surprising. Candidates like Trump and Carson, who have made negative remarks about minority groups, can be successful in the Republican Party because they are expressing views shared by many members of the party. While O'Malley is correct in suggesting that Democrats are less prejudiced against minority groups than Republicans, for members of these minority groups, this fact is not truly comforting. Minority individuals do not get to choose whether the potential employer they contact or realtor they see or police officer they interact with is a Democrat or a Republican. Even if they could restrict their interactions to Democrats, they would still have a pretty good chance of experiencing prejudice and discrimination. For America's minority groups, the real issue is not which party is less prejudiced, but what will Americans who care about equality and equal opportunity do to reduce the high levels of prejudice and discrimination in America.